Between touring museums and temples, Vietnam’s National Assembly president has been meeting with Cambodia’s top leadership to build ties between the two countries and discuss long-standing border disputes during a four-day visit. The primary purpose of Nong Duc Manh’s trip is to strengthen Vietnam’s relationship with Cam­bodia, said Kol Pheng, secretary general of the National Assem­bly, which organized the trip. Nong Duc Manh also spoke with Cambodian leaders about border disputes, and they ag­reed to work harder to resolve the periodic conflicts, Kol Pheng said. Kao Kim Hourn, executive director of the Cambodian Inst­itute for Cooperation and Peace, called the trip a solid step in building confidence between the two countries. The most pressing issue now is border relations. 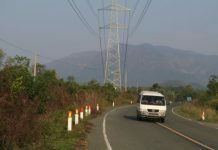 There are several disputed areas along the border and armed patrols from both countries have had at least one tense standoff in recent weeks. 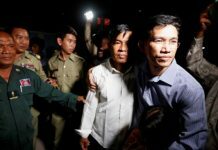 Returning from a trip to Vietnam in July, Senate President Chea Sim said both sides are committed to resolving the border disputes by the end of 2000. As Nong Duc Manh was arriving Friday, a group from the Student Move­ment for Demo­cracy burned Vietnamese flags at the Royal University of Fine Arts to protest border encroachments. Police prevented the students from standing along Pochentong Boulevard as Nong Duc Manh’s motorcade drove into the city. 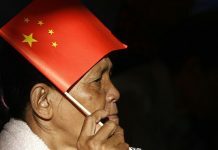 The government hung Viet­namese flags at several areas of the city, including the Independ­ence Monument, for the visit. He laid wreaths at the monument and Vietnamese-Cambodian friend­ship memorial, before embarking on two days of sight-seeing around the city. He visited Tuol Sleng, the National Mus­eum, the Royal Palace and a garment factory and met with National Assem­bly President Prince Norodom Ranariddh. He left Sunday for Siem Reap to visit Angkor temples. Today he will tour Banteay Srey temple and have dinner with Prince Ranariddh. Tuesday, he is scheduled to return to Phnom Penh and meet with Prime Minister Hun Sen and Chea Sim before returning to Vietnam. The last high-level Vietnamese official to visit Cambodia was Le Kha Phieu, general secretary of the Vietnamese Communist Party, who toured Cambodia in June, 1999.